I enjoyed this condo but there was alot of construction noise going on each day, including the weekend, which made my time on Maui disappointing. I understand that these things may take place, but it lasted most of the day, each day, that and the sound of road traffic, resulted in me keeping the lanai doors closed all the time. We are sorry to hear that you have experienced this during your stay. This was not what we would ever want our guests have to bear and for the disturbance, we deeply apologize. If we could have done anything to make your stay better, we would have happily obliged. Although we cannot control the outside circumstances, we do apologize and hope that it did not deter you from enjoying your stay. Thank you again for your feedback and we look forward to having you stay with us again in the future. The grounds and pool area are very nice and very well maintained. 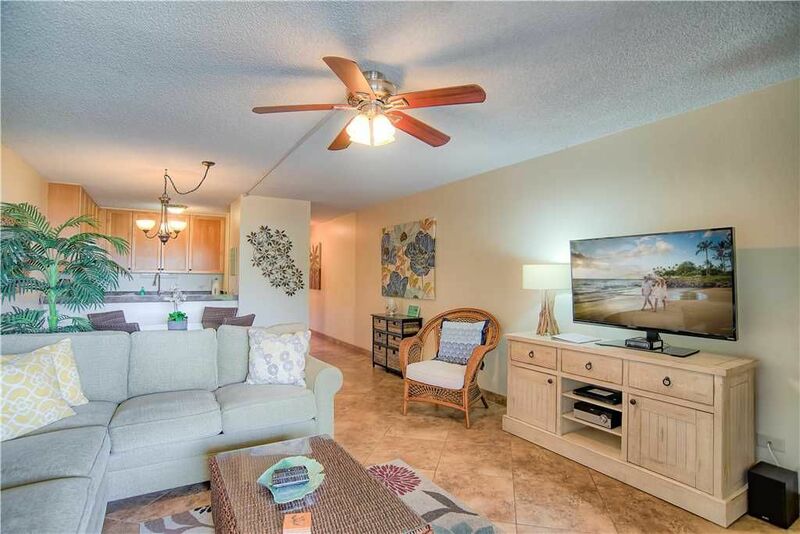 The location is recommended for anyone who wants to stay in the Kihei area -- across the street from Kam III beach and great sunsets.There's 24-hour security. The check-in process is clean and simple: the management company send you an email with all the info and a code for getting into the unit. The complex itself seems populated mostly by vacationing families. No party animals while we were there. You get an assigned reserved parking space. (Ours was occupied when we got there, but the onsite office straightened that out.) The building has its own grilling area, with two nice, clean grills. The unit was generally clean (see exception below). Nice, spacious patio with good furniture and seating for six. There's a closet on the patio where beach stuff is stored -- chairs,cooler, snorkel equipment, etc. (although the umbrella needs to be replaced). The other furniture throughout the unit was in good condition. Having 2 bathrooms was a plus when you're trying to get ready to go out.There are separate AC units in the bedroom and living room. We really didn't need them in December, and can't comment on them. The bathrooms are clean and serviceable but need some updating, especially the MB. The porcelain on the tub was chipped in a few spots and rusting. There's some moderate noise from traffic on a road that runs aside the unit. Not terrible or constant, but it's there ( but it doesn't affect sleep). Some of pans in the kitchen need to be replaced. Not sure which, but either the tile floor or the rug in the living room needed cleaning. That was evidenced because (as requested by owner) we walked around barefoot and soon noticed that the bottoms of our feet got grungy. I'm guessing the rug needs to be shampooed or the cleaners need to do a better job on the tile floor. Summary: We would like to see a few changes and updates to the place, but we wouldn't hesitate to stay there again if we were looking for something in the Kihei area. Thank you for your detailed feedback regarding your stay. We were happy to be able to host you and your guests for your getaway to Kihei! There are so many things to enjoy in the area and it is great to know that you were able to take full advantage. Guest satisfaction is something that we take very seriously and it was a pleasure to provide you with suitable accommodations for your vacation. Understanding your discontentment with some of the mentioned items, we are fully committed to implementing what we can to make the overall guest experience better. We have hosted many vacations over the years and with this will come with normal wear and tear. Our apologies for any shortcomings on the matter as this is not what our guests have become accustomed to. Reviewing our processes and procedures, we will make sure that our housekeeping team are following the standards that we hold highly. Again, we would like to thank you for your feedback. This is how we can improve the vacationing rental experience for all future stays. If you ever find yourself back in the area, do not hesitate to give us a call. It would be our pleasure to host you once more. I’ll get right down to it. On the plus side the condo was clean and spacious. On the down side the bed was extremely uncomfortable. The mattress had a very cheap foam pad on it that killed my back after a few nights of sleeping on it. I switched to the sofa bed and while I found that mattress better it was still worn and uncomfortable. Just not as bad as the bed. The stained bedding on it didn’t help either. I’m an international airline pilot that spends half my time on the road and have spent many nights on hotel beds so I think I’m qualified to speak o the matter. I’ve stayed in everything from the Shangri-La in Shanghai to the terrible Timberland Motel in Dryden, Ontario. Additionally please be aware that check out time is very early at 10:00 and the management company V Trips was very inflexible in extending that even by an hour. Lastly the view from the balcony isn’t anything to write home about. It’s the back of the building and the best thing about it is that it is fairly private. Also this is one of the back buildings so the walk to the beach is significant.....just FYI. The property is well maintained and beautifully landscaped. Aloha. Hello Hunt. We would first like to thank you for your feedback. It is extremely important to us and crucial in our attempt to improve for the future. We would like to sincerely apologize for your stay not being quite as comfortable as you would have liked as well as the stained bedding. You will be happy to know that the foam mattress topper has been removed. Our housekeeping team works both efficiently and diligently to provide the level of cleanliness that our customers have come to appreciate and we apologize if this was not the case for you. Guest comfort is one of our main priorities and it pains us to hear that in this instance, we may have missed the mark. We truly understand your reluctance to return; however, in the future, feel free to give us a call. Even though we go the distance to provide all of our guests with an exceptional vacation experience, in the event we come up short, we always try to make it right. Thank you again for your feedback and it is our hope that this experience does not hinder you from vacationing with us once more. We had a great time in Maui, but I was honestly a little disappointed with this condo. When we arrived, the code that had been given to me was incorrect. Debby did answer the phone (thank goodness) and was able to provide the right code, but it was a little stressful. The condo was definitely functional, but it wasn't very clean (mildew on the shower curtain, gross carpet in the living room). The pictures definitely make it looks nicer than it actually is, and I think it's definitely overpriced. The pullout was pretty uncomfortable, and it would have been awful trying to have two adults sleep on it. (Two kids...maybe.) There were four beach chairs, which was nice, but they were all slightly broken. All in all, it worked fine, but I wouldn't stay here again. Aloha! Wow, I'm very disappointed to hear this. I am always only a call or text away for any issues whatsoever, and I tell every single guest of mine this. As I told you, my software program was having issues. Sometimes electronics don't work properly. As you stated, when you called me I immediately gave you another code. No big deal at all- this is what I'm here for! I would have immediately brought you a new shower curtain as well and sent the cleaner back over if there were a carpet that was dirty. I replace beach chairs constantly because guests break them and don't tell me. Again, I would have brought you new one immediately had you reached out to communicate this to me! I am a very hands on property manager that is a LOVER of humanity and I do absolutely anything within my power to assist my guests with an amazing stay. I'm sorry you didn't contact me, as I would have very happily done whatever I can to make your stay even better. May the spirit of aloha follow you home and enrich your life.